Simon says, "You can be replaced"
I would love to see everyones input on this. Eh, "Paul is Dead" is the first "conspiracy theory" I ever encountered in my life. I think I was about 15 or 16, and me and my cousin had just "discovered the beatles". It didn't take long before we read somewhere of this story, and started looking for all these clues on the covers and in the songs. It was a bit like "playing detective" following the traces deliberately left by someone, and only occasionally we would stop to ask ourselves: "is this really true?" "Why would they give away the secret like that?" Today I think about it a bit differently, knowing what I know about the need of the pigs in charge to be "on top" of the fakery and controlling the "rumors" and the conspiracy theories. It only makes sense that the same people who caused this alleged identity replacement would also leak out the theory about it, so that it would remain forever confined within the boundaries of a "game" of the Beatles entourage. Nobody could "discover it" and break the news to the world. The "official" conspiracy theory came packaged with a number of absurdities meant to send the people in wrong directions, and make the story a self-destroying one: for example the idea that Lennon and Harrison were trying to warn the world placing all those clues: too bad they did it with a helpful hand from Faul himself, who posed in the "revealing" pictures, such as on the cover of "Abbey Road". Today I know this is a method, and not just a game of hide-and-seek with the fans. Then, after having read David McGowan's research about the Laurel Canyon music-military community, the old "Paul is dead" idea acquired also a scenario, a context, moved towards the light so to speak. I am not saying I have a comprehensive or decisive opinion on the matter: but very interesting links, and a remarkable blog it appears to be. Thanks for the info. Some years ago I discovered that there were people who seriously believed in the "PID" (Paul is Dead) thing and it surprised me as I had thought this was "debunked" long ago. But, I began looking into it and eventually came to the surprising conclusion that he was in fact replaced by an impostor which was also the conclusion of an Italian "Wired" article from a year or so ago. I suppose I will be attacked for this but I kept digging and found (IMO) that actually all 4 of them were replaced at the same time and they weren't the only ones (then or since). I can't say I blame anyone for not believing this as I didn't believe it at first either but after extensive study of photographic, video and audio evidence as well as my own personal memories (I'm 60+) that is the only conclusion I can come to. It is also remarkable that, without entering into the "Paul is Dead" clues, the collection of characters showcased on the infamous Sgt. 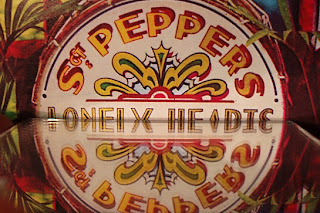 Pepper's cover appear in fact to be composed of notable freemasons, and/or of their potential "creations" and "controlled" icons (yet they're all cut-outs, as in "paper characters"). From Polyester Crowley to Bernard Shaw (author of "Man and Superman" and also a favorite of the Cheers/Frasier crew), from H.G. Wells to Aldous Huxley. Why would kids in their twenties, rich and powerful beyond their dreams, sure, but also of proletarian extraction, waste their time with such dreary subjects as Crowley or Huxley? Who really was calling the shots here? lux wrote: I suppose I will be attacked for this but I kept digging and found (IMO) that actually all 4 of them were replaced at the same time and they weren't the only ones (then or since). I can't say I blame anyone for not believing this as I didn't believe it at first either but after extensive study of photographic, video and audio evidence as well as my own personal memories (I'm 60+) that is the only conclusion I can come to. Hmm, never heard that one before. I can understand the "Paul is dead" theory, but I don't know about the others. nonhocapito wrote: It is also remarkable that, without entering into the "Paul is Dead" clues, the collection of characters showcased on the infamous Sgt. Pepper's cover appear in fact to be composed of notable freemasons, and/or of their potential "creations" and "controlled" icons. From Polyester Crowley to Bernard Shaw (author of "Man and Superman" and a favorite of the Cheers/Frasier crew), from H.G. Wells to Aldous Huxley. Why would kids in their twenties, rich and powerful beyond their dreams, sure, but also of proletarian extraction, waste their time with such dreary subjects as Crowley or Huxley? Who really was calling the shots here? I think you will enjoy this proposed solution to the Sergeant Pepper's enigma. to me when I read it a year ago. The rabbit hole is surely deep. I would look forward to hearing your impressions. from P.I.D. debunkers and naysayers, which says something, I'm sure. pshea38 wrote: I think you will enjoy this proposed solution to the Sergeant Pepper's enigma. Well I browsed that thread and read it here and there -- I enjoyed it at first but eventually... not so much. It seems to me the perfect example of how the "conspiracy theory" paradigm can be used to carry everyone in a fairly irrational territory where everything is significant, and nothing is particularly significant. You are not supposed to get out of that world a smarter person, in my opinion. Instead of making an effort to simplify our perception of the world, obfuscated by deceit as it is, these researchers seem to be voted to make things utterly complicated, so that the knowledge is never really shared; they keep holding all the keys; no real advancement or emancipation is achieved in the process. I find the experience quite depressing. There are interesting elements pointed out in that thread, of course -- some, maybe not the central ones, are extremely interesting -- but also a ton of pseudo-clues used to come to unwarranted conclusions. The problem with this method is that completely different solutions could be drawn from other arbitrarily chosen or interpreted clues, so where this leaves us? This other page, for example, seem to get to completely different lands and it is equally based on observation and research based on all these symbols. The cover contains an enormous quantity of elements that can serve as a clue. I think that it becomes eventually suffocating to remain confined inside it. One has to get out of its confines and step back into the real world. I would have appreciated better a bit of context and a lot more of research "outside" and "around" the cover. Who worked at that album? Who designed the cover? Was really heroine-addicted John Lennon -- or any of the other twenty-years olds -- involved in this? etc. But I see that someone on that thread also picked up the 1-1-9 numbers allegedly buried in the drum at the center of the cover. That's certainly a weird clue, and in a very important spot. I think it is possible that these secret societies, that seem to be involved in a lot of the media products for the masses we deal with (among other things), were aware already decades ago that these numbers were going to be important someday, although maybe it wasn't clear yet exactly how. This clue makes the pair with Kennedy having allegedly scribbled the numbers 9-11 and the word 'conspiracy' on a piece of paper back when he was president, and it certainly is a fascinating hint. Forget the clues and album covers, etc. The "clues" are a red herring and are used to debunk the whole PID thing. They are there so that when anyone thinks of PID they think of the stupid clues and dismiss the whole thing. The clues are BS. You can see that PM was replaced just by studying the photo and video evidence. It's just a different guy after 1966. Different ears, different "hair swirl", different height, different facial features, etc. Look at the Plastic Macca site -- there's lots of data there. There are behavioral differences too. It's not easy to do at first because we are so accustomed to identifying certain people in a certain way. We were shown the impostors so often that we automatically accept that it's them when we see their photos. And, getting past the similar voice is the hardest part. We identify people more strongly by voice than by visual features evidently. You have to sort of "de-program" yourself by viewing before and after evidence without fixed ideas as to identity and you will "see it" and you'll get what I mean. It takes time and study. I'm convinced all 4 were replaced at the same time but I can't blame anyone for not believing that. It's easy to fool people with impostors, especially if you get the voice right. And, there are other examples as well. It's a whole subject in itself. Celebrity is an extremely powerful force in our culture and that concept has not been lost on the perps. I suppose it's also possible, that Heather Mills on hearing the rumours may have decided to make people speculate about it. This notion that all the Beatles (not just Paul) were replaced around that period in 1966 intrigues me (and others, I'm sure). Care to post some of the photographic and video evidence you say you have accumulated regarding this? There is virtually no difference between these photographs, taken 11 years apart. Notice how perfectly all of the features fall on top of each other, the teeth, the eyes position, the overall head shape: even his Adam's apple perfectly matches. These overlapping portraits were taken in 1963 and 1974. 11 years apart. They seem to match perfectly, indicating that John was probably not replaced in or around 1966 as you say you believe. Do you have any information/photos/video to disprove this image I have posted? I look forward to your response. The above is a news article on the BBC website regarding the White House officially denying contact with aliens/extra-terrestrials. It came about from a 'WeThePeople' website [?] set up by the US Govt which would answer any question so long as 5,000 people petitioned for the question. In light of the questions being asked [or possibly because of the one about alien contact] the Govt has now increased the requirement for the petition to be at least 25,000 instead of 5,000! On the same day that the BBC has announced that the death toll in Syria is passing 3,500 we should petition for war not to begin against any 'aggressor-nation' unless the death toll is 25,000 or more. Re the "PID" Beatles 'conspiracy' theme. 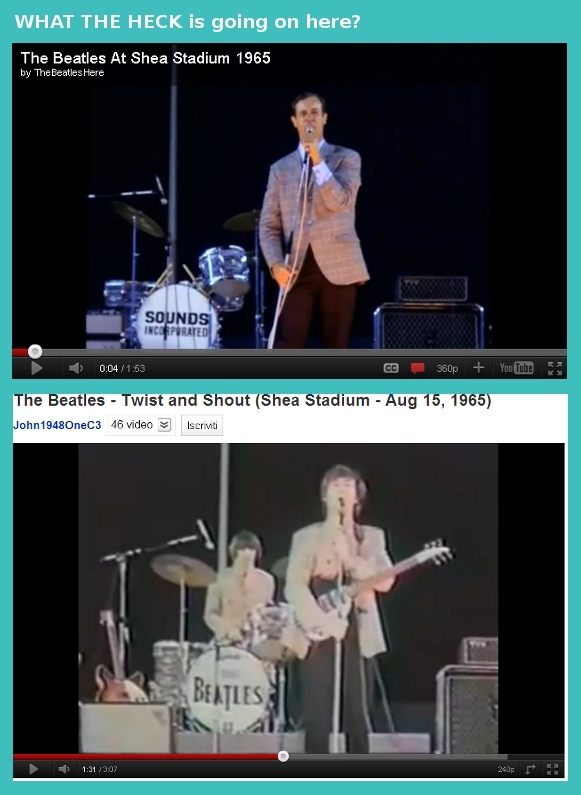 Sorry, but if that first 'plasticmacca' site link to a mash-up mess of extremely poor quality and altered pics with different expressions, angles, lighting, hair lengths/styles/thickness and ages of McCartney is any indication of the supposed proof of his "replacement", it is more of a joke than the original rumor ever was. Gave me a goldbug déjà vu, quite frankly. However, if anyone claimed plastic surgery could literally replicate an individual, I would point them to every Hollywood actor (male & female) who has tried to either 'improve' or regain their own features and failed (often miserably), e.g. the 'lip disasters' of Melanie Griffith, Anne Archer, Madeleine Stowe, and face lift/reconstructions of Cher, Burt Reynolds and Mickey Rourke. So, as there is still no surgical wizardry that can make people look exactly like they were themselves when younger, how could they make a person look identical to someone totally unrelated? As those familiar with genetics and aging differences would know, a man's physiology and bone structure continues to grow/change as he matures from late teens to 20s, and that how they age afterwards is determined by genes, personality and lifestyle. As another observable example, there are also some actors whose appearance changed so dramatically over time that they became almost unrecognizable — the most extreme (without any surgical interference) being Rod Taylor and Clint Walker. Well, that's my 2 cents (from many years of observation and interest in those relevant and related subjects). Some food for thought at least.